InvestInBlue: What’s Art got to do with it? A joint blog post of Future Earth Coasts (FEC) (Shona Paterson, Hester Whyte & Martin Le Tissier), MaREI (ERI/UCC) (Aoife Deane), East Carolina University (Lisa Beth Robinson), University of Wisconsin (Kristin Thielking) and geographer & author Mrill Ingram. Are we going about it all wrong? Tell you what – let’s throw a bunch of artists and a geographer from the States plus an Irish public engagement specialist in the FEC-ing mix and explore how we can make Sustainable Development Goal 14 Life Below Water more prominent on peoples agenda….so the scene setting began for a workshop session held at the second Society and Sea conference where we explored how Art could facilitate, ignite and support Global Coastal sustainability. 1. 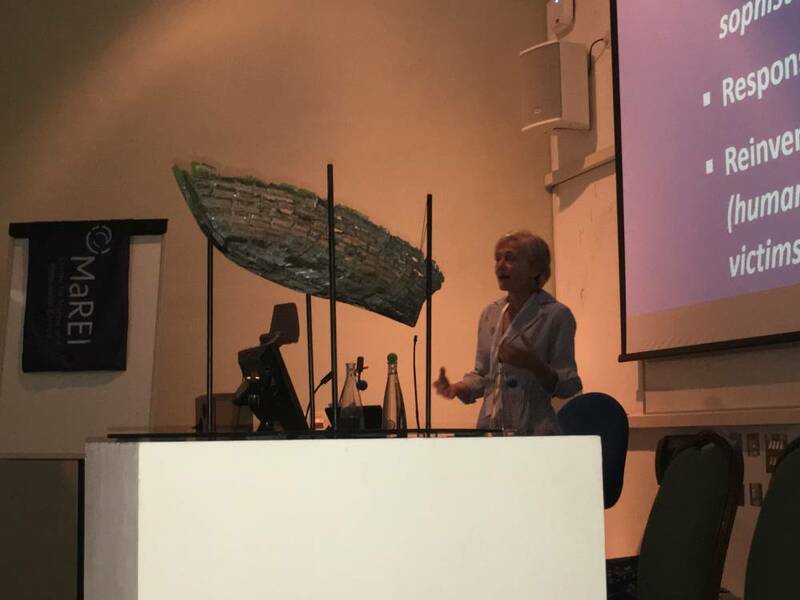 Shona Paterson outlining the challenges of aspirations & opportunity spaces and chairing the session which kick-started with Hester Whyte explaining the inter-activeness of this workshop by introducing the padlet site and online slido tool used to capture participants understanding and meaning of SDG 14. 2. 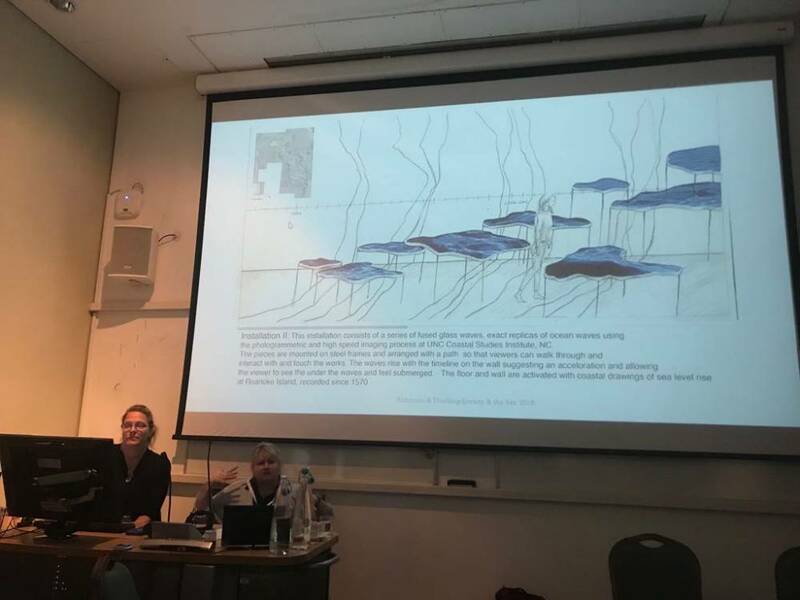 Mrill Ingram talked us through the concept of Orphan Spaces: the diplomacy of art by showing us examples of art-science collaborations in a number of wetland areas in New York’s Long Island and the Bronx, highlighting reinvention and re-imagining the narratives. 4. 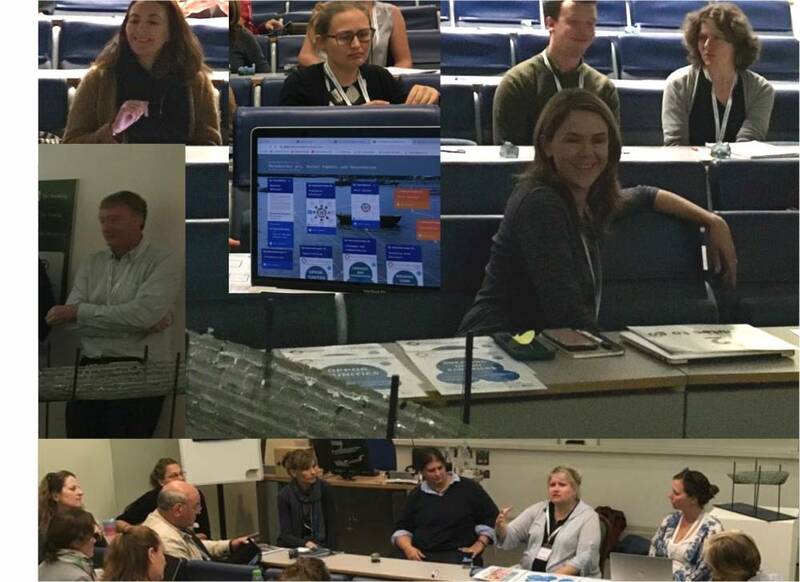 After the presentations the session was filled with discussions, looking at overcoming barriers, linkages and opportunities for collaboration, exchanging ideas and sharing experiences of art and science integration. 3. Artists Lisa Beth Robinson and Kristin Thielking then took us on a journey of how they are conceptualizing the ocean by showing us the process, the difficulties they had to overcome and the technical challenges of ‘capturing waves’ to then be transformed into glass and become part of a number of art installations that ‘submerge’ the viewers explaining Sea Level Rise. Aoife Deane facilitated the participant’s feedback and inputs as they were captured directly within the online tools or transcribed during the session to maintain the real-time inter activeness of the workshop. 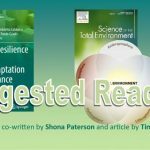 In a world of constantly shifting biophysical and social realities, we face an ever-evolving and urgent need for new ideas around the conception and realisation of sustainable development. 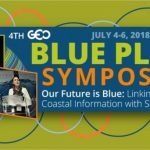 This is especially pertinent in coastal land and sea spaces: spaces where the greatest confluence of societal activities occurs and some of the most productive and dynamic natural systems must co-exist. 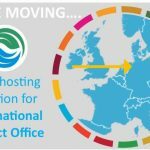 Despite continued discourse around the importance of the oceans and coasts, epitomised by Sustainable Development Goal 14, Life Below Water, gaining traction remains agonisingly slow when it comes to shifting behaviours or resonating with society on a broader scale. But how do we broaden the conversation? How do we change our own operating procedures in order to galvanise momentum for action? We all recognise that people process knowledge and communicate that knowledge differently. Historically there has been a strong connection between the Arts and Sciences, just think of the work of Leonardo da Vinci who is recognised as a master of Art and Science. Both Science and Art share a common motivation and goal to understand and describe the world around us. Art, in its many and varied forms, has the liberty and ability to generate shifts in social perceptions and behaviors in ways that science and data alone currently do not. An immediate need to reinvigorate linkages between the arts and sciences is in order to address urgent issues of our time. 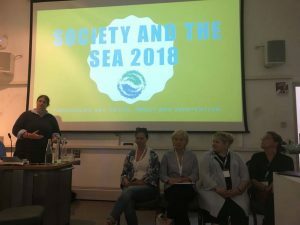 It is around this statement that a long-held dream was dragged into reality during the Society and the Sea Conference in Greenwich, UK (Sept 6-7th). Despite recognition of the need to connect art and science more closely, truly integrated, co-designed, and co-produced collaborations between art and science disciplines are still rare. We (FEC) in collaboration with two talented artists (Lisa Beth Robinson and Kristin Thielking from East Carolina University and the University of Wisconsin respectively), an author and geographer (Mrill Ingram) and a communication and engagement specialist (Aoife Dean from MaREI) are attempting to do our bit to change this. 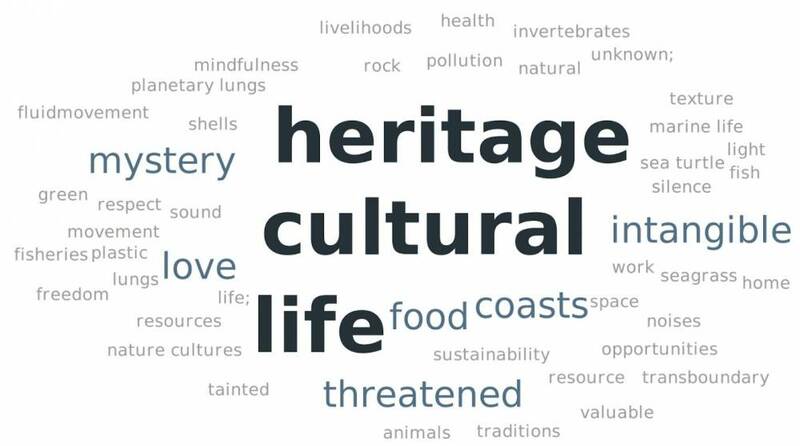 We started the session asking participants what they associated with SDG14 which created this word cloud. 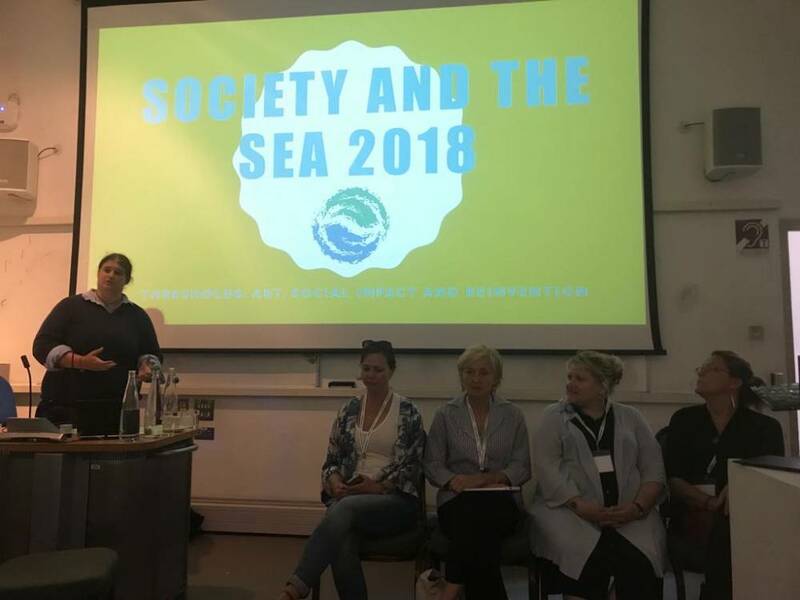 Our session at Society and the Sea, entitled Thresholds: Art, Social Impact and Reinvention, engaged both artists and scientists in a facilitated knowledge exchange designed to generate collaborative pathways for action. 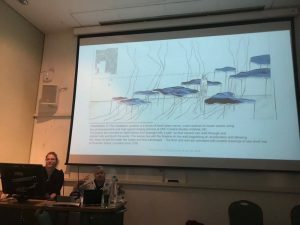 By discussing past and current projects, as well as future aspirations, we were able to outline opportunities and challenges for art-science integration throughout project instigation, execution, and sustainability phases. 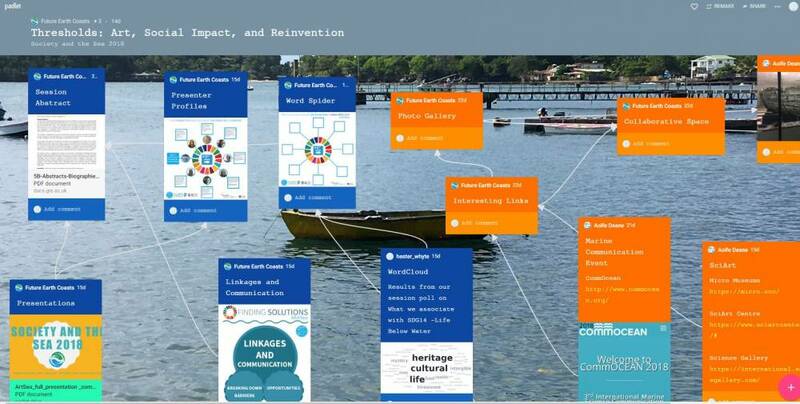 ONGOING OUTPUT: To capture the session not only before and during the workshop but also to become a platform that lives on beyond the conference we set up a Padlet site. 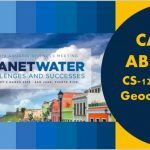 An online space where you can find all the presentations as well as the session abstract, interesting links and photos. 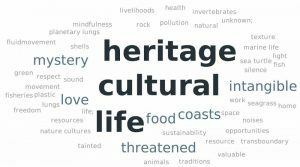 To access the padlet site go to: https://padlet.com/FutureEarthCoasts/ArtSea Note: You can comment on the existing content or add anything you think can be of interest by simply logging into the Padlet site. 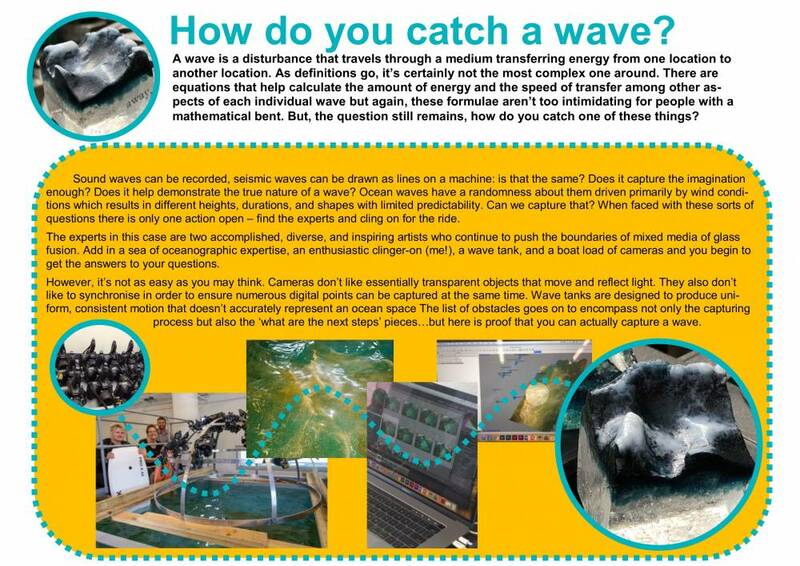 We were also able to present, and more importantly discuss, an ongoing project (See below and/or download here: How do you catch a wave?) 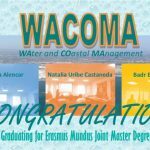 as an example of work designed specifically to deliver Sustainable Development Goal awareness and resonance with multiple audiences in the media of glass fusion and photogrammetry. 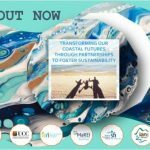 This is but the first outing of a collaboration that has several long term goals associated not least the aim to take advantage of the aspirational and collective nature of the sustainable development goals and the UN Agenda 2030 to inspire meaningful and impactful collaborations around coastal and ocean spaces. 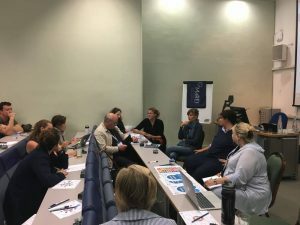 The Sea for Society conference was held at the Greenwich Maritime Centre based in the beautiful grounds of the Royal Naval College at the University of Greenwich. A conference dinner was held in the nearby Cutty Sark – one of the last tea clippers to be built and one of the fastest, coming at the end of a long period of design development, which halted as sailing ships gave way to steam propulsion.